As you can probably tell from my post about Homemade Lo Mein, I love Asian noodle dishes. I love lo mein. I love pad thai. I love rice noodles. I love udon noodles, in all their incarnations, from a soupy bowl full of veggies and broth, to a savory saute with a sauce. So, when I found the recipe for Udon-Shiitake Stir-Fry with Sake and Ginger in Vegan Planet, I knew I had to make it. I hit noodle gold with this recipe. The sauce is sweet from the shiitake and agave, yet earthy from the mushrooms and sesame oil. 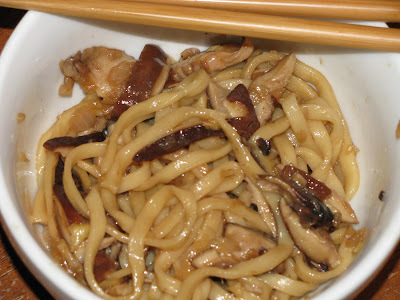 The shiitakes are silky and a little meaty while the udon noodles are wonderfully chewy. At the end of each mouthful, the ginger lends a bracing bite. These noodles were as good as any I can get at an Asian restaurant in my area. 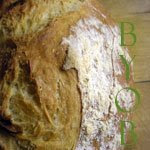 And the recipe is so fast to make that it is on the table before take-out could possibly be. I know these noodles will become a regular in my household. 1. Cook the udon noodles according to package directions. Drain and toss with sesame oil. Set aside. 2. In a small bowl, combine the sake, tamari, and agave until well blended. Set aside. 3. Heat the oil in a large skillet or wok over medium-high heat. Add teh shallots, mushrooms, and ginger, and stir-fry until the mushrooms are tender, about 3 minutes. 4. Stir in the sake mixture and udon noodles, and cook, stirring, until heated through, 3 to 5 minutes. Serve hot. This says it serves 4. In my house, it only served 2. We didn't have any sides or salad, so perhaps that is why. I am more and more attracted to asian flavors lately and would love to give this recipe a go. Love anything with mushrooms too. Thanks for sharing this.